Danone Canada is investing in its Boucherville head office plant to increase yogurt production. 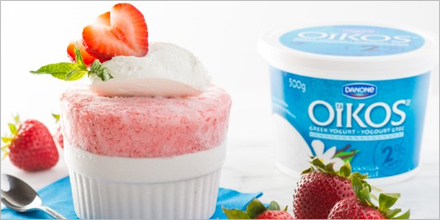 New equipment will be installed for the manufacture and packaging of its very popular Oikos Greek yogurt. At a press conference to introduce the project, Québec Premier Pauline Marois, joined by Élaine Zakaïb, Minister for Industrial Policy and the Banque de développement économique du Québec, announced that Investissement Québec is granting Danone Canada a $5-million interest-free loan. The funding is part of a major development project representing a total investment of $40 million, which will allow Danone to equip its Boucherville plant with state-of-the-art equipment. This is Danone's second major investment in Québec. In 2010 the company injected $50 million in its Boucherville facility to produce the probiotic drink DanActive, which was previously made in the U.S.